Sea level rise, large-scale flooding, and new conveyance arrangements for water exports may increase future water salinity for local agricultural production in California’s Sacramento-San Joaquin Delta. Increasing salinity in crop root zones often decreases crop yields and crop revenues. Salinity effects are nonlinear and vary with crop choice and other factors including drainage and residence time of irrigation water. Here, we explore changes in agricultural production in the Delta under various combinations of water management, large-scale flooding and future sea level rise. Water management alternatives include through-Delta water exports (current conditions), dual conveyance (through-Delta and a 6,700 Mm3yr-1 [or 7500 cfs] capacity peripheral canal or tunnel) and the flooding of five western islands with and without peripheral exports. We employ results from previous hydrodynamic simulations of likely changes in salinity for irrigation water at points in the Delta. We connect these irrigation water salinity values into a detailed agro-economic model of Delta agriculture to estimate local crop yield and farm revenue losses. Previous hydrodynamic modeling work shows that sea level rise is likely to increase salinity from 4% to 130% in this century, depending on the increase in sea level and location. 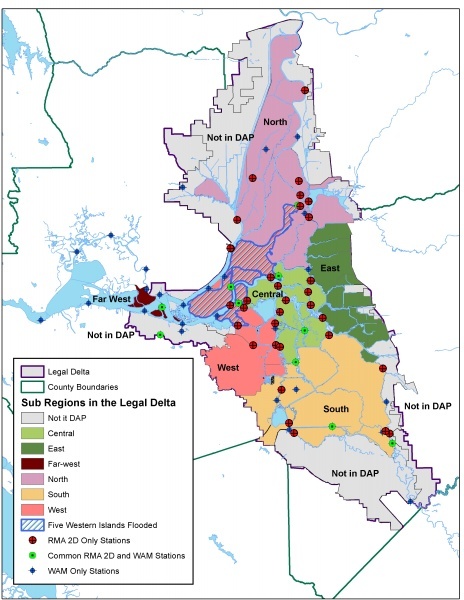 Changes in water management under dual conveyance increase salinity mostly in the western Delta, and to a lesser extent in the north, where current salinity levels are now quite low. Because locations likely to experience the largest salinity increases already have a lower-value crop mix, the worst case losses are less than one percent of total Delta crop revenues. This result also holds for salinity increases from permanent flooding of western islands that serve as a salinity barrier. Our results suggest that salinity increases could have much smaller economic effects on Delta farming than other likely changes in the Delta such as retirement of agricultural lands following large-scale flooding and habitat development. Integrating hydrodynamic, water salinity, and economic models can provide insights into controversial management issues.